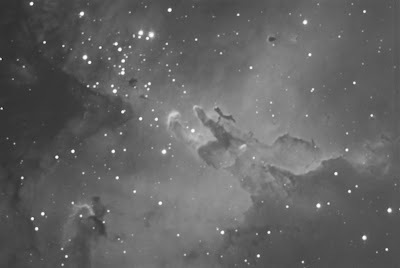 Here is my first-ever photo of the Eagle Nebula. This is a stellar nursery, all these stars are newly born. The image is zoomed in on the center of the nebula, the whole thing won't fit in my field of view. I think it turned out really nice. Saw one skunk in the backyard while photographing. 92 minutes total exposure.